Remember, remember the 5th of November – the fireworks started early for me as I was invited to be one of the judges for this year’s Shell Plays. 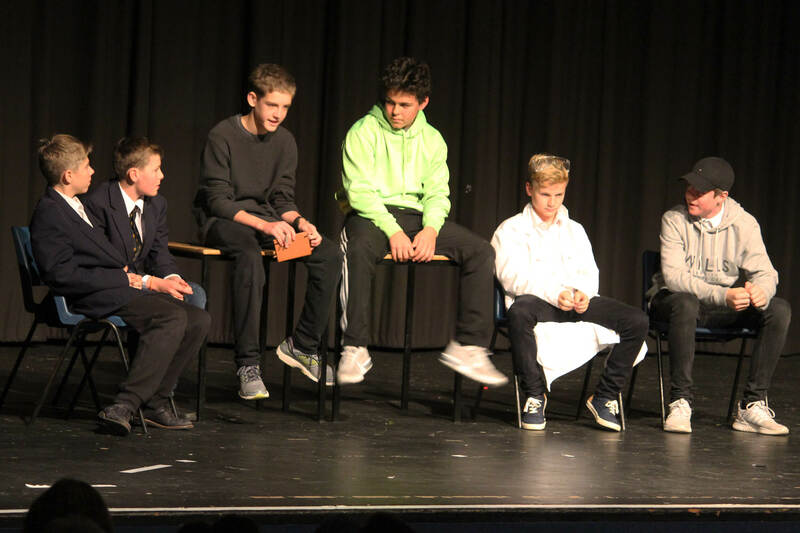 My first introduction to Shell drama has left me impressed with the talent on show and excited by levels of commitment and creativity that clearly went into a successful afternoon of theatre. 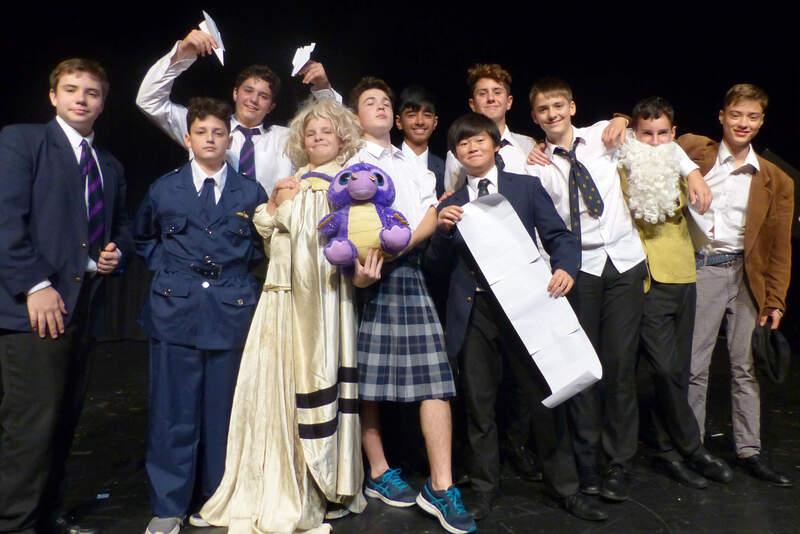 It is great to see that the School recognises the benefits of producing plays as an effective way of strengthening teams and bonding friendships through shared creative endeavour around this year’s theme ‘The Sky’s The Limit’. The event began with The Meeting directed by Tim Keeling and Misha Kirillov. It was a well-structured and intelligent piece of writing that saw us thrust into the heart of the play, quickly establishing a strong central conflict as a team of creative architects battled with the more earth-bound financiers over proposals for one of the world’s first skyscrapers – The Empire State Building. Tensions mounted throughout as clever dialogue saw the argument being laid out by both sides and ended at a point of suspense as the decision to build or not to build was left hanging in the air. Special mention to the writing that took an ambitious subject, crafted a simple premise and focused the action into a solitary meeting in a single room. The next play took us from 1930’s New York to very different world for The Xena Universe. Clever use of sound, lights and costume saw this production pick up the award for technical achievement that transported the audience into a world of fantasy and make believe. I hope the actors managed to remove all the very effective stage make-up although I wouldn’t be surprised if they were still looking a bit green the next morning. Kid Street Elite brought us back down to earth with a gritty, tragic tale of a life cut too soon as rival gangs fight over reputation and jealousy. 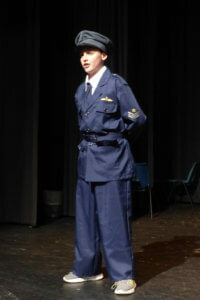 Quality narration was provided by Joe Porter who kept the audience informed with relish and clarity. 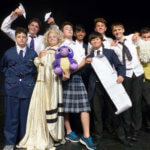 Mistakes on a Plane made effective use of comedy as jokes peppered the script and kept the audience entertained and engaged in a high stakes ‘Bryanair’ flight. Special mention to the comic timing of chief steward Freddie Lappin who carefully rode the laughter of the audience while making sure all the details were heard – a difficult task in such a large auditorium. Believe in Better employed a neat narrative device to take us on a whistle-stop tour of television shows starting in ‘Central Perk’ aka Friends and finishing with an ambitious finale of dance as the central characters are thrown into an episode of Britain’s Got Talent. Man’s Not Hot was a solid moral tale where the use of narration kept the audience on track as the story developed. Next came Susie and the Dream, an accomplished and well thought through piece of work. The opening scene, beautifully blending movement and text, was particularly striking and propelled us into a story of resilience and against-the-odds ambition. Special mention to the direction that saw clever staging bring clarity and simplicity to this engaging tale. The next play, When I Was Young contrasted well its use of anarchic comedy and satire. 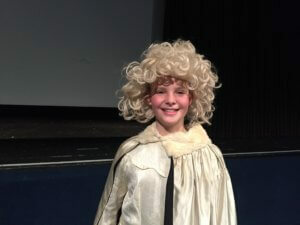 Where else would Daenerys, Mother of Dragons, hold stage time with Kenneth Grahame the author of The Wind In The Willows? 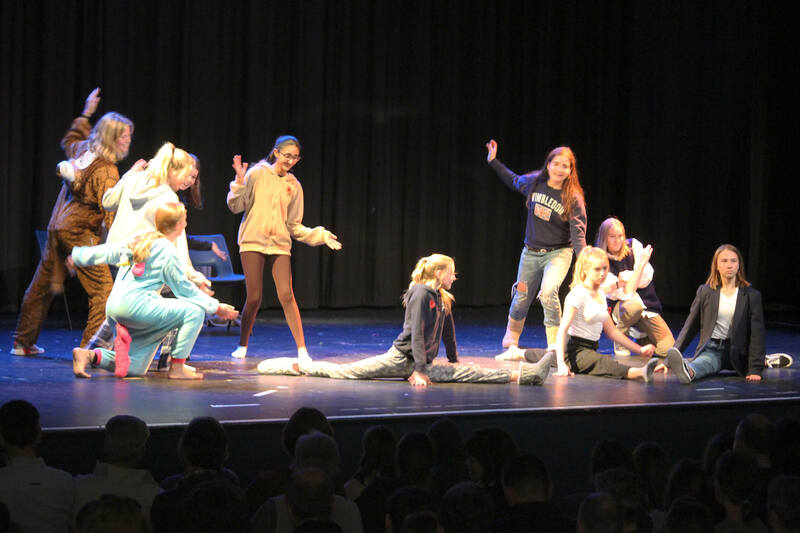 Strong ensemble work throughout and effective costumes and characterisation brought the alumni of the School to life in a refreshing and energising way. The next three plays, What Comes Around Comes Around, Get Inspired and Inter-Dimensional Cable each brought moments of delight and built cleverly on the Sky’s the Limit theme. 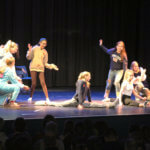 From an effective piece of animal embodiment, through clever choreography and use of movement to an ambitious time-travel play that tested the filmic knowledge of the audience, all had their points of merit and achievement. 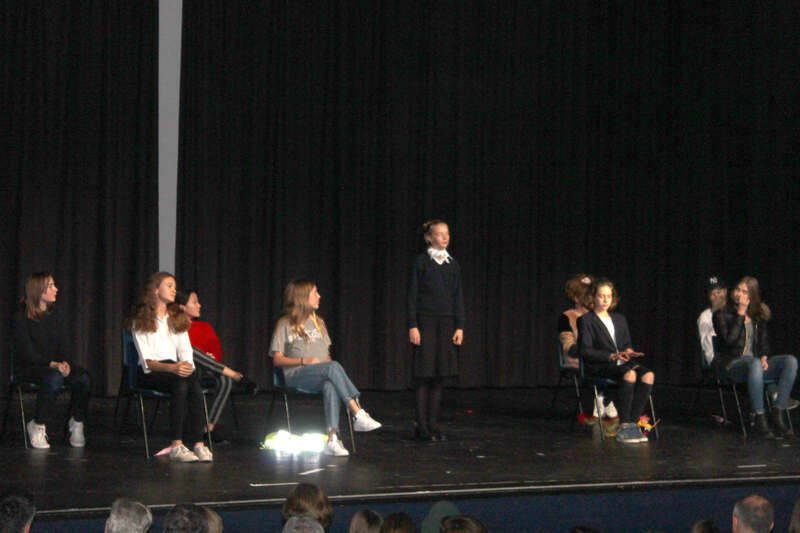 Finally came the play that was awarded the top prize: Girl Power directed by Aerin Hobbs, Evie Faber, Dasha Emelyanova and Amelia Brooks. 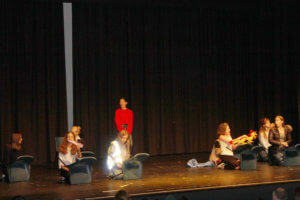 A bold and skilled performance of a clear and memorable play. The jeopardy was really made to count as the drama unfurled and a strong and positive message landed along with a dramatic narrative that kept the audience enrapt from start to finish. 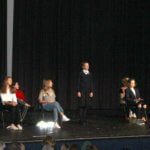 Thank you to all that took part and came to see these plays. I hope Ria and I will see you all at The North Wall and we look forward to developing a strong relationship with the staff, pupils and parents of the School.